Plants are sessile organisms and are not able to move away from adverse environmental conditions and must response to an array of environmental and developmental cues. They heavily rely on high sensitivity detection and adaptation mechanisms to environmental perturbations. At the same time plants do not have immune system, but possess preformed and inducible defense resistance. These include programmed cell death, tissue reinforcement at the infection site, and production of anti-microbial metabolites. Activation of 'local' responses establishes secondary immunity throughout the plant (SAR), which is long lasting and effective against a broad spectrum of pathogens. Phytoalexin biosynthetic enzymes, such as phenylalanine ammonia lyase (PAL) and chalcone synthase. Pathogen infections activate above genes present in the host, which produce PR proteins. Pathogenesis-related (PR) proteins are host-encoded, abundant proteins induced by host in the event of a pathogen attack. They are induced as part of systemic acquired resistance (SAR). Some of these proteins are antimicrobial, attacking molecules in the cell wall of a bacterium or fungus. Others may function as signals that spread news of the infection to nearby cells. Infections also stimulate the cross-linking of molecules in the cell wall and Change cell wall composition by enzymes providing structural support to cell walls via synthesis of lignin, suberin, callose, glycoproteins, and these responses set up a local barricade that slows spread of the pathogen to other parts of the plant. Apoptosis (death of cells) at invasion site to physically cut off rest of plant. Hypersensitive Response (HR): It is a mechanism, used by plants to prevent the spread of infection by microbial pathogens. The HR is characterized by the rapid death of cells in the local region surrounding an infection. The HR serves to restrict the growth and spread of pathogens to other parts of the plant. The hypersensitive reaction initiates many changes in plant physiology and biochemistry. The HR is analogous to the innate immune system found in animals and commonly precedes a slower systemic (whole plant) response, which ultimately leads to systemic acquired resistance (SAR). Systemic Acquired Resistance (SAR): It is by activating defense responses in uninfected parts of the plant. As a result, the entire plant becomes more resistant to subsequent infections. This systemic acquired resistance (SAR) is long lasting and often confers broad-based resistance to a variety of different pathogens. The earliest detectable cellular events are ion fluxes across the plasma membrane and a burst of oxygen metabolism. Elicitor increases the open probability of plasma membrane located ion channels and may thereby stimulate elevated cytosolic calcium levels, as well as activate additional ion channels and pumps. Mediated through the regulation of plasma membrane bound enzymes. These include changes in Ca2+- ATPase and H+- ATPase activities. Receptor mediated ion fluxes trigger localized production of NO (Nitric Oxide) and ROIs (Reactive Oxygen Intermediates) immediately after pathogen recognition. These second messengers synergistically induce cell death, defense gene expression and production of Salicylic Acid (SA) and more ROIs, establishing a putative feedback loop in which the response is amplified (Figure 2). Molecular signal transducers, whose active or inactive states depend on the binding of GTP or GDP, respectively include two major subfamilies, the heterotrimeric G proteins and the small G proteins a subunit has the receptor-binding region and possesses a guanosine nucleotide binding site and GTPase activity (Figure 3). Both classes of G proteins use the GTP/GDP cycle as a molecular switch for signal transduction. Protein kinases Phosphorylation cascades are involved in defense signaling at many different levels. Some plant resistance genes encode receptor-like protein kinases themselves activate downstream. Signaling elements by phosphorylation, others - secondary messenger such as Ca 2+ may trigger the protein kinases. Rice Xa-21 and wheat Lr10 encodes receptor-like kinases. Transient elevation of cytosolic calcium levels necessary for elicitor stimulation of the oxidative burst. Extracellular generation of ROS is a central component of the plants defense machinery. ROS act as direct toxicants to pathogens, catalyze early reinforcement of physical barriers and are involved in signaling later defense reactions, such as phytoalexin synthesis and defense gene activation, programmed cell death and protective reactions. SA Plays a critical role in the activation of defense responses . Increases in the levels of SA and its conjugates have been associated with the activation of resistance responses in a wide variety of plant species. These increases slightly precede or parallel the expression of PR genes in both the infected tissue as well as the uninfected tissues exhibiting SAR. Salicylic acid inhibits the activity of catalase and ascorbate peroxidase by serving as a one electron donating substrate - SA free radicles. Phenolic free radicals are potent initiators of both lipid peroxidation and protein oxidation. Lipid peroxides, the products of lipid peroxidation, were shown to induce PR-1 gene expression during the process SAR (Figure 4). Ethylene levels increase during the HR (Hypersensitive response). Ethylene treatment induces the expression of PAL (Phenyl ammonia lyase) and the basic PR genes, as well as several wounding-induced genes. Ethylene can also enhance the SA-induced expression of PR-1 in Arabidopsis. The activation of defense responses after mechanical wounding and insect attack mediated by systemin (an 18- amino-acid peptide), as well as by JA and its ester, methyl jasmonate (MeJA), collectively termed jasmonates. Wounding, systemin, and jasmonates induce proteinase inhibitors (PI) I and II, PAL, and JIP60. The PI proteins reduce herbivory and insect attack by inhibiting key degradative enzymes. JIP60 has been proposed to reduce pathogen attack by mediating polysome dissociation. Many of the signals are probably integrated into one of a few terminal pathways that lead to the transactivation steps involved in the interaction between activated transcription factors and pathogen-responsive cis elements in the promoters of defense genes. A single pathogen elicitor may activate multiple transcription factors that interact with different cis elements in the same or different promoters, leading to induction of many defense genes. Host recognition of pathogen elicitors initiates early signaling events such as protein phosphorylation/dephosphorylation, ion fluxes and oxidative burst. Subsequent transcriptional and posttranslational activation of transcription factors leads to induction of plant defense genes such as GST and PAL, and biosynthesis of endogenous secondary signals such as SA. 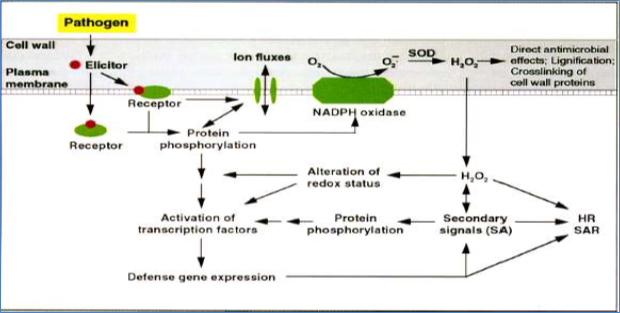 In addition, the activated NADPH oxidase complex generates reactive oxygen species (ROS) such as 02- and H202 that alter the redox status of plant cells and affect defense signaling (Figure 5). SA, ROS, as well as defense genes and SOD, superoxide dismutase all contribute to the development of HR and SAR during plant-pathogen interactions. After plant-pathogen recognition, multiple signaling components (CPR5, NDRl, EDSl, DNDs, LSD11) are employed that lead to the formation of reactive oxygen species (ROS) and HR, and the synthesis of SA. NDRl and EDSl are involved in transducing signals from separate subsets of avr-R interactions, the relative positions of other genes have yet to be determined. It is also unknown whether these genes (except CPR5) are involved in the JA- and ethylene-mediated resistant responses. Virulent pathogens can also induce SA synthesis and local resistance, probably through separate regulatory components such as PAD4 and EDSs. Further downstream, the CPRl SA-NPRl linear pathway has been demonstrated by various genetic analyses. The pathway of JA and ethylene is proposed on the basis of the wound response in tomato 1511, showing that JA and ethylene induce each other's synthesis and that JA and ethylene are both required for activating the wound response, PDF 1.2 and Thi2.1 gene expression, resistance to P .parasitica,and ISR (Figure 6). It remains to be determined whether these responses (shown in rectangular boxes) share regulatory components downstream of JA and ethylene. The SA pathway and the JA/ethylene pathway may interact antagonistically, with SA inhibiting both the synthesis and the signal transduction of JA and ethylene. The possible involvement of NPRl in the SA-independent but JA- and ethylene dependent ISR is intriguing. Further characterization of NPRl and another Arabidopsis component CPR6, which is involved in regulating the expression of both PR and PDF1.2 genes, should provide new insight into the relationship of these pathways. The formation of phenylpropanoid phytolalexins after fungal infection involves a very rapid induction of PAL. Numbers of plant defense genes contain an elicitor responsive TTGACC element. This element is also present as the W boxes in the parsley PR-1 gene promoter. Transcription of the parsley PR-2 gene is stimulated rapidly by fungal or bacterial elicitors and mediated by an 11-bp cis element (CTAATTGTTTA) present in its promoter. A 10-bp TCA (TCATCTTCTT) element is present in the promoters of many stress-inducible genes, including tobacco PR genes. A 40-kD tobacco nuclear protein binds to this TCA element in an SA-dependent manner. Scandalios, J. G. (2005). Oxidative stress: molecular perception and transduction of signals triggering antioxidant gene defenses. Brazilian Journal of Medical and Biological Research, 38(7), 995-1014.Scandalios, J. G. (2005). Oxidative stress: molecular perception and transduction of signals triggering antioxidant gene defenses. Brazilian Journal of Medical and Biological Research, 38(7), 995-1014. PhD 1st year student at Indian Agricultural Research Institute, New Delhi, pursuing Doctrate in soil science and Agricultural Chemistry.